Abandoned on the doorstep of a nun-run orphanage, Moe (Chris Diamantopoulos), Larry (Sean Hayes) and Curly (Will Sasso) spend their childhood causing all manner of mischief and mayhem to those who surround them. Older, and having left years worth of destruction in their wake, they come to the realisation that the home they’ve grown to love is on the verge of closing due to their immaturity and mounting debts. Driven to make amends and secure a future for the Sisters of Mercy Orphanage they set out into the big city in a bid to raise the money needed. With a narrative that’s split into three sections – each 27 minutes long – and a ludicrous and wholly unnecessary sub plot involving Lydia (Sofia Vergara) and her dastardly schemes to kill husband Ted (Kirby Heyborne), The Three Stooges quickly erupts into a madcap series of skits and gags that, while appropriately fast-faced and senseless, is severely lacking in creativity and spirit. Not only is the tomfoolery (eye-pokes, head conks and slaps are the norm here) overdone to an extreme by the screenwriters, but there’s also far too much packed into a trim 92 minute running time for most viewers to keep up with. The result is a film that’s swift, yet noticeably hollow, with many of the moments that are evidently supposed to be more poignant instead feeling somewhat out-of-place in amongst all the hysteria. The camaraderie between the trio and Peter Farrelly and Bobby Farrelly’s classical directorial style keep it afloat, but most of what occurs is of a disservice to Diamantopoulos, Hayes and Sasso, whose talents and willingness to humiliate themselves for the viewers pleasure deserve more than the screenplay prohibits. 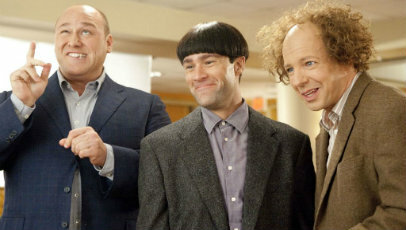 The Farrelly brothers may not have been completely successful in recreating the Three Stooges’ trademark comedy, but what they have fashioned is an adequate children’s film (although a PG certificate often feels inappropriate due to the brutality of some gags and the filmmakers love of Vergara’s cleavage). The Three Stooges may not be what the brothers were aiming for, but at least it’s not the cinematic disgrace many were anticipating.